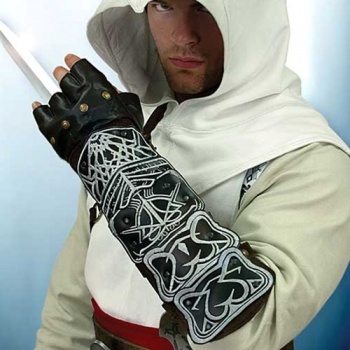 Now you can officially cosplay as Altair and other characters from Assassin's Creed with this replica clothing and weaponry. As discovered by Kotaku, a company called Museum Replicas is now offering Assassin's Creed replica clothing and weaponry that can be used to perform your very own real life assassinations (please do not actually assassinate anyone). If you're able to sneak up on someone while wearing Altair's hooded tunic, boots, belt, and vambraces, you'll be able to give your target the sweet release of death just like in the game (please do not actually give this to anyone). Museum Replicas is even selling some weaponry to commit the foulest of deeds with (please do not actually perform foul deeds). The coolest is this Assassin Extension Knife that slides in and out of place. It'll need to be sharpened before use though, so don't expect to be dealing out death right after signing for the package (please do not deal out death). You could also pick up some throwing knives and the Sword of Altair while you're at it, to complete the set. For role-players, further on offer are the Crusader Priest Robe, Lionheart Gambeson, and other garb of characters besides Altair from Assassin's Creed. If you really want to live out the game, you'll have to convince your prey to put those on too (please do not convince prey). This stuff is a little expensive, but not priced all that high compared to other types of replica gear. Please, readers, if you're planning to go all Mega64 on unsuspecting strangers, leave the blades at home. On second thought, don't purchase them at all; I'll probably get blamed for the inevitable murder and I enjoy my freedom too much.